KAZAN, Russia (AP) For Barcelona, Lionel Messi is a goal machine, the club’s top scorer who has frequently been decisive for the Catalan club. But for Argentina at the World Cup, not so much. At four World Cups, in 19 matches, Messi scored six times, not including a penalty converted in a semifinal shoot-out against the Netherlands in 2014. All of Messi’s goals were in group-stage games. He never scored in his eight knock-round games, in 2006, 2010, 2014 and, finally, a 4-3 loss to France in the round of 16 on Saturday. 1. June 16, 2006, 88th minute: In his first World Cup appearance, Messi scores the last goal in a 6-0 group-stage victory against Serbia. 2. June 15, 2014, 65th minute: Breaking a goal drought stretching back to 2006, and which lasted through the 2010 World Cup, Messi scores Argentina’s second in a 2-1 group-stage win against Bosnia. 3. June 21, 2014, 91st minute: Messi gets the winner in a 1-0 group-stage victory against Iran. 4. June 25, 2014, third minute: Messi opens the scoring in a 3-2 group-stage win against Nigeria. 5. June 25, 2014, 45th minute: Messi gets Argentina’s second goal in the victory, but then doesn’t score for the rest of the tournament, including the final lost to Germany. Marcos Rojo nets Argentina’s winner against the Nigerians. 6. 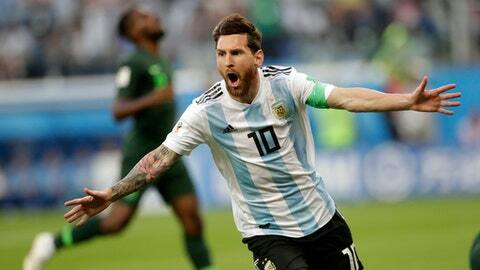 June 26, 2018, 14th minute: After missing a penalty against Iceland, Messi opens his account at the 2018 World Cup with Argentina’s opening goal in a 2-1 must-win group-stage victory against Nigeria. Rojo again gets Argentina’s winner.